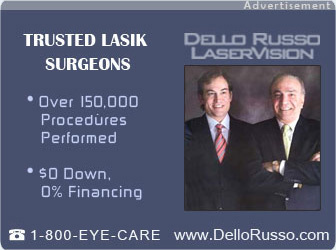 Dello Russo Laser Vision Lasik Can Eliminate the Need for Reading Glasses New York, NY, April 16, 2015 — Dello Russo LaserVision is excited to announce that they started research on a new LASIK procedure that can eliminate the need for reading glasses in the near future. Their bifocal LASIK procedure, which can often completely eliminate the need for glasses after laser vision correction, has become one of the most popular surgeries among middle-aged patients in the past fifteen years since it was adopted by this laser center. Read more.